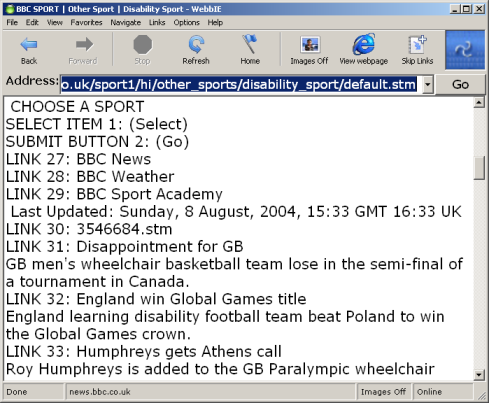 Download WebbIE, the web browser for blind and visually-impaired people. This is legacy documentation retained for archival purposes. Go to the current version of WebbIE Web Browser. WebbIE is available only for Microsoft Windows with Microsoft Internet Explorer 6. Download and run the file below to start installation. It should work with Windows '98/Me/2000/XP. Opens PDF files in Google so you can read them just like web pages. Comes with Accessible RSS and Accessible Podcatcher and Directory, letting you get news and radio programs quickly and easily without having to navigate big cumbersome web pages. Cleaner, simpler user interface: less confusing to use and better working so you can do useful things faster. 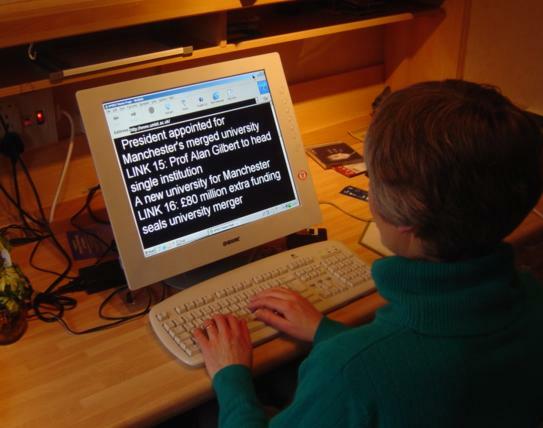 For visually-impaired users, the ability to zoom web pages and to set font sizes, colours and zoom for every web page displayed in Internet Explorer - make browsing on your machine suit you, not web designers! Better control over downloading images in Internet Explorer, letting you speed up your browsing if you don't use images. Some people may have older machines or prefer an older WebbIE version, so here you go: we do recommend you upgrade to version 3.1, though. WebbIE version 1.1 download for very old machines.